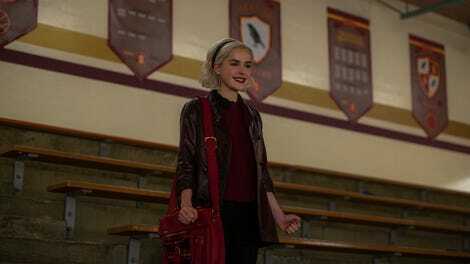 One of the more intriguing elements on Chilling Adventures of Sabrina has been how much the characters themselves don’t know who their enemies are. Even a figure as powerful as Father Blackwood doesn’t seem fully aware of which powers are taking an interest in the fortunes of Sabrina. And Sabrina herself is struggling to figure out her place in a world that simultaneously pushes her further into Satan’s realm while offering constant new sources of danger from the same place. This becomes especially clear in her efforts to become Top Person at the Academy. On the one hand, she’s embracing her new powers and her new school, but she’s still not doing it in exactly the way the powers that be want her to. Both her new world and her old one are very wrapped up in some very old-fashioned ideas about which people should be doing what, a conflict that plays out in different ways in each place. Over in the mortal world, Theo is still struggling to be accepted for who he is, but meeting barriers at every step. It’s a compelling struggle, but the show consistently has trouble portraying it in a way that makes his thinking clear. Why is Theo so invested in being on the basketball team? The bigotry espoused by the other players is an existing conflict we’ve seen all along, but the whole plotline ends up being a little confusing. Theo has never been interested in sports before. Is he in some way modeling what Harvey does, because Harvey is sort of an ideal boy? Or is the point that he wants access to the masculine worlds he’s been denied? Either would be an intriguing subtext to the proceedings, but it’s never suggested that that’s what’s happening here. He’s playing a sport he’s not very good at so he can spend more time with people he hates. Why is this the setting for this battle? It’s frustrating, because the show’s commitment to telling Theo’s story is commendable—it’s not one that ends up on TV often (or at all), and there are undoubtedly many people, and many young people, who benefit from seeing it told. Having Theo, or any of his friends, interrogate why this, specifically, is what he wants, would give the story more resonance than a simple “the coach and players are bigots” angle. It also leads to some questions about what Wardwell’s doing. Why does she care about whether Theo gets to try out for the basketball team? Did Satan tell her to become principal? 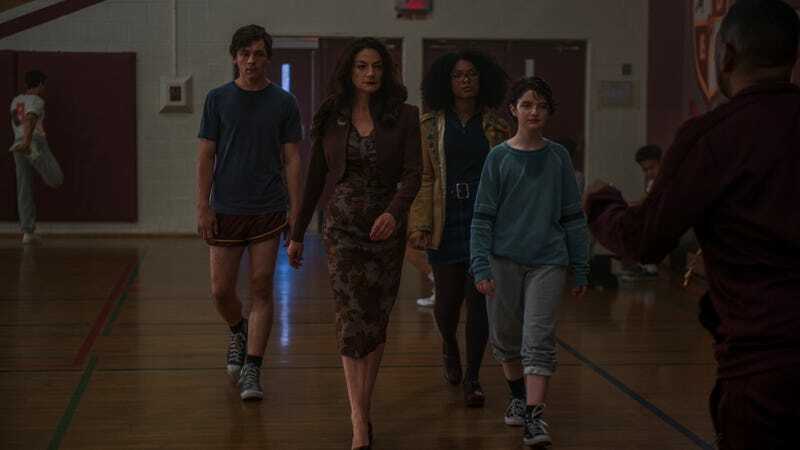 Why would an immortal witch spend all day running a mortal school that Sabrina doesn’t attend anymore? I’m no school administrator, but there is no way she wouldn’t be spending literally every hour of every day in meetings settling disputes and managing budgets or whatever. Maybe she’s found a new passion for education. She does seem to be a least moderately invested in the same battle for a seat at the table that Sabrina is driving back at the Academy. Sabrina’s battle plays out as something unfortunately all too familiar to any woman who’s ever struggled for every step of progress while watching men blow off work and get rewarded. She spends the first night cramming for the challenges ahead, while Nick gets to go out with the guys to a fancy club. Even the difficulties they face are wildly different in scope: demons try to kill Sabrina, and Father Blackwood plays a mean prank on Nick. The ensuing challenges are a little uneven—it’s not ideal to have Zelda expositing about how hard the questions are, since the viewing audience has no way to gauge the difficulty of what they’re each being asked. And the bubbling cauldron test is also odd. Hilda tells Sabrina that appropriately rhyming couplets are important, and then Nick ineptly pairs “blood” with “good,” which doesn’t remotely rhyme, and is congratulated on how well he’s doing. Is this…additional commentary on the perks men are given on their way to the top? Still, ol’ Nick comes through in the end, teaming up with Sabrina in an attempt to out Blackwood as the perpetrator of the demon summoning spell. Unfortunately, it’s not him, though he does seem awfully interested in preventing everyone from learning what the demons are trying to do to Sabrina. Whatever it is, it may or may not be on Satan’s behalf. How much support does Satan have among his followers, when they’re as violent and unpredictable as this batch? Seeing as Wardwell is annoyed enough by the proceedings to summon Satan himself to her house, we might be about to find out. “If I’m the hand that molds our young pupil’s minds, these are my fingers.” Gross, man. A weird thing that stuck out to me was Hilda repackaging Pepto-Bismol in a fancy glass beaker. It comes in a perfectly good container! It even has a little cup to help you measure out your dosage. Zelda knows what shade is, Hilda does not. Sounds about right. Imagine being trapped in a house for 75 years and then having to go back to high school. Poor Ambrose. Look, it’s nice that Nick is being a good ally to Sabrina, but “I don’t mind a little competition, especially when it’s so damn cute” is a hard pass. It’s not clear yet how Father Blackwood will finally push Prudence over the edge, but her revenge will presumably be glorious. Shoutout to Zelda for asking for what she needs in her relationship with Blackwood. Kids, if your partner isn’t respecting you, ask for more.